If love is a verb, our love for LA extends from Tujunga to Malibu, from Monrovia to Manhattan Beach. With all our hearts and every turn of a shovel, we aim to leave each of you with healthier, more beautiful places for you to do you. By FormLA Staff: From the beach to the valley, the FormLA gardens featured on the 2017 Theodore Payne Foundation Native Garden Tour reflect their specific niche within LA, as well as their owners’ style. Get a sneak peek at the three returning favorites. For the Love of LA – Stop Sacrificing! By Cassy Aoyagi: We know you love LA. We hear it in what you are willing to sacrifice for her good – your lawn, your pool, your roses. What if lush, leafy, loveliness is actually better for California’s leading lady? It’s true. Stop Sacrificing! El Nino underperformed, but El Nina is bringing her level best to this relationship. You’ll see it in your garden and in our wildspaces. As rain continues to refresh our city, FormLA maintenance teams are preparing our water-wise gardens to look their best, rain or shine. If you are going it alone, visit our month-by-month Maintenance Checklist to be sure your garden is getting the love it needs this month. Our clients, our heroes! 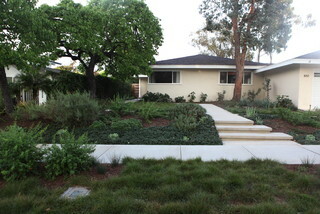 Lorraine Sanchez and Hilda Weiss inspired the creation of the all coastal native garden that now surrounds the Santa Monica Conservancy Preservation Resource Center. Here they are celebrating the garden’s 1-year anniversary with the neighborhood with a native raffle – they never stop! Cassy and Kirk Aoyagi joined Eagle Scout Troop 394 in prepping LA Fire Station 74 in Tujunga for the community installation of native plants. Kirk Aoyagi joined University of Southern California students to install a new native garden outside Queens Court. See this new spot of lovely the next time you visit campus! Attending the Oscars? Stop by the Oscars Gifting Suite for a lovely book by Susan Gottlieb: The Gottlieb Native Garden: A California Love Story.